When you shell out a month's worth of rent or sacrifice Starbucks for six months to scrimp and save for a pricy, investment piece handbag, you want it to last forever and remain in style for just as long. But styles change and trendy "It" bags can be forgotten. However, Fendi is selling handbag straps so bag owners can instantly update, upgrade, and customize a bag they already own. The "Strap You" program, which launches with nine, two-tone options that boast gold or silver snap hooks, is not a cheap option, thanks to a reported price tag of just under $1000. The straps are expensive due to the name brand and the exotic materials, like python. There are leather and studded and embroidered options, too. Here's how it works, according to Women's Wear Daily. Customers can nab a shoulder strap to update a purse they already own. They can also have their initials added for another degree of personalization. Two font sizes are available so far. 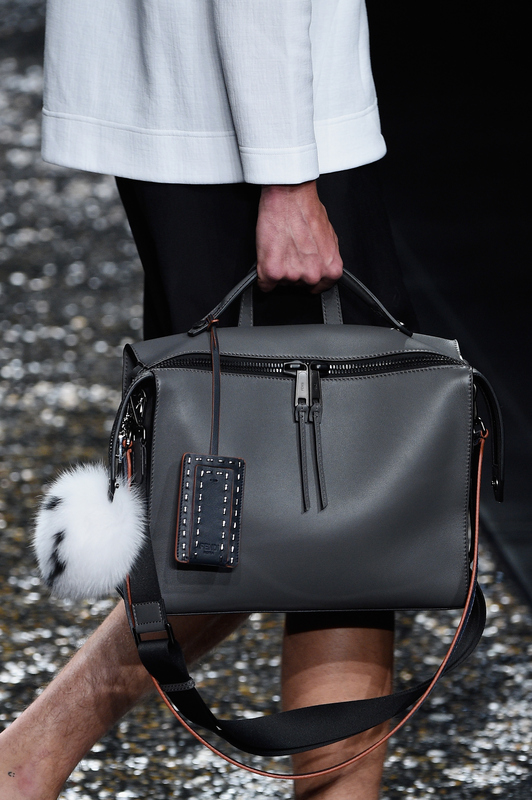 The straps won't land until November and they will be sold in Fendi flagships at first. There are plenty of other cheap and creative ways to customize a handbag without shelling out even more loot cakes for a new strap. Here are my three best options if you want to give your investment bag a boost. Think of it as the ultimate high-low mashup. I look at it this way. I mix my Mackage leather hoodie, which would retail for $1000 but I got it for half-price at a sample sale, with $49 Hollister jeans through the winter months. It's the same concept if you add an inexpensive embellishment to a bag. All luxe designers sell very expensive bag charms at department stores. You don't have to go that route. There are tons of adorbs options on Etsy, like the one pictured above. Anyone who sees it will ask, "OMG, where did you get that?" Not only do you get to support an independent artist by purchasing on Etsy, but you also get something that isn't available en masse. You can pick something that really speaks to you and your personal style. Rocker Steven Tyler is known for embellishing his mic stands with lots of scarves. You can do the same with a bag, although you may want to choose a single scarf. Knot a colorful or print scarf around the strap of a neutral-toned bag to give it some oomph. Scarves are not in short supply and you can get a gorgeous option at Target, on Etsy, on eBay, wherever! I found this hand-painted silk scarf with a gorgeous, colorburst pattern on Etsy in two seconds. I love the idea of supporting someone who made something super unique with their own hands! Yes, a plush clip-on is super young and girlish. But it's also super cute. You are only as young as you feel and I love the serious contrast of adding something so adorbs to something pricy and luxe. It will keep you grounded. Of course Claire's has plenty of plush clip-on options, like the adorable cheapie pictured above. Customizing and adding personality to a handbag can be fun and fashionable without making a dent in your wallet. Try it.